More recently, some market commentators have focused on the inversion of one part of the curve - and what it means. Sonal Desai, Chief Investment Officer, Franklin Templeton Fixed Income, says the shape of the yield curve has become meaningless in terms of advising investors as to whether a US recession is imminent. Our senior investment leaders said a US recession is not likely in the near term, despite slowing US economic growth. 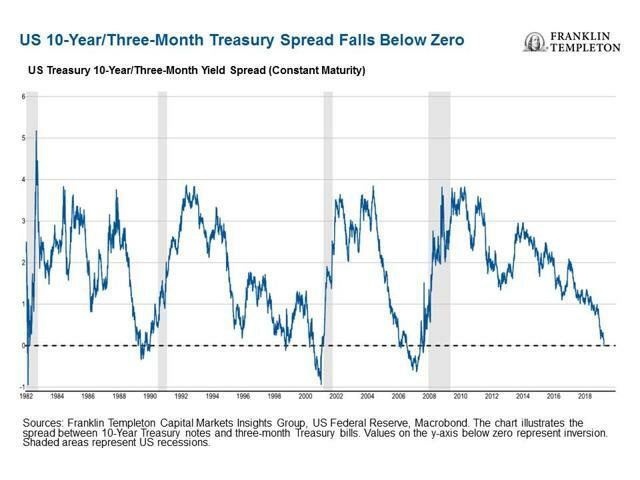 The more widely followed part of the US yield curve is arguably the spread between 10-year and 2-year Treasury notes. 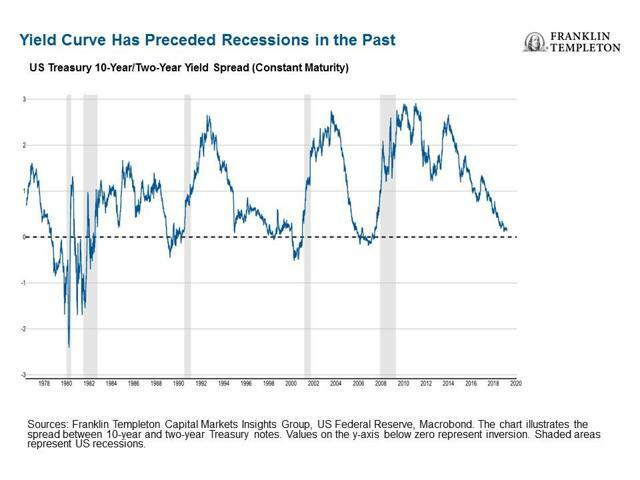 As Ed Perks, CIO of Franklin Templeton Multi-Asset Solutions, points out in this article, when that part of the yield curve has inverted in the past (falls below zero), US recessions have generally followed. Meanwhile, various fundamental factors have kept a lid on long-term rates in recent years, the long-dated 10- and 30-year Treasury instruments. Some market observers have noted that without another quantitative easing program, the Fed can't control the long end of the yield curve. Even if the spread between 10-year and 2-year Treasury yields inverts, some of our senior investment leaders have seen signs that the predictive power of the yield curve may not be as powerful as it has been in the past. For example, after the financial crisis of 2007-2009, the Fed purchased significant volumes of Treasuries at longer maturity dates. Desai says this Fed buying has impacted the price of securities, meaning that the long end of the yield curve has become a function of market mechanics almost independent of economic growth fundamentals. "The market is still looking at the yield curve as sending a signal. I just find that baffling." - Sonal Desai, November 12, 2018. "I think there has been too much bearishness, this view that the US is about to enter a recession, or is in a recession, I think that is overstated. However, I do think there are some growing concerns fundamentally about long-term sustainability-this idea of massive reckless deficit spending, the populist politics that lead to uncoordinated and often volatile economic agendas." - Michael Hasenstab, March 25, 2019. Sonal says there seems to be a consensus that the US is going to enter a recession by the end of 2019 or in 18 months. However, she doesn't see a triggering mechanism for that recession at this time. "What I find a little bit more tricky to figure out, in that time horizon, is what is going to cause that recession? Because we do have those strong labor markets, we don't have, by any means, a hawkish Fed-the Fed is very dovish. [High] Energy prices-another leading culprit-not around. Financial stability and asset-price bubbles, that's what we are looking at." - Sonal Desai, March 25, 2019.